It would appear that the apps we and our kids have on our devices may actually be hacking our brains. In “Brain Hacking,” a recent episode of 60 Minutes, correspondent Anderson Cooper interviews tech insiders who bluntly admit that apps are often designed to create an addiction-like behavior. Cooper speaks with Tristan Harris, a former Google product manager. To build in an addictive quality to their products, designers and programmers include features to increase “engagement” and create a stronger need for the user to interact. One example that Harris gives is Snapchat’s use of “snapstreaks,” which require users to send snaps within 24 hours of the last one. This pressure can cause teens to stress about going on vacation, for example, prompting them to give their password to friends to keep the streak going. There are companies solely devoted to the neuroscience of “brain hacking” in programming. Dopamine Labs is one such startup that is constantly experimenting to see when to increase social media engagement and notifications for highest interaction from users. For example, sometimes apps withhold notifications until a more effective time when they can send a burst. This creates more of a hit of dopamine, the feel-good hormone that gets triggered when we’ve been rewarded. There is a reason Facebook (and others) use a continual scroll: it is much more addictive. The idea of technology being legitimately addictive is still being studied and debated, but there is no doubt that it affects us in addictive ways. Problematic media use is a term that describes dysfunctional ways of engaging with media and encompasses many related terms, including Internet addiction, technology addiction, Internet gaming disorder, and others. Media users’ problematic relationships with media and devices, such as smartphones, could be characterized as compulsive, obsessive, or unhealthy. 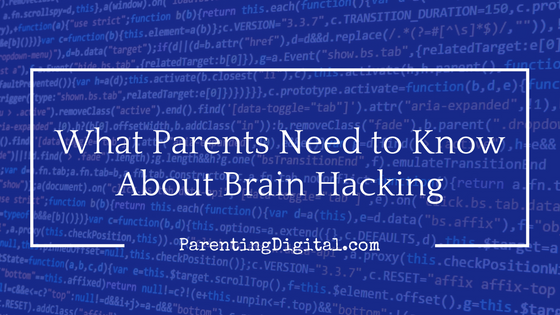 What can parents do to prevent brain hacking? So, now we know what most of us already suspected (just examining our own tech use.) What can we as parents do about this? Create tech-free zones in the house and through the day. Talk to our kids openly about what tech may be doing to us. Avoid preaching; instead, just explore together how it changes us and how it might affect relationships in positive and negative ways. For younger children, especially, create opportunities for the reward center of their brain (dopamine) to be triggered by things other than screens. Encourage, challenge, and mentor our tweens and teens how to turn off notifications and features that encourage constant checking of our devices. Be sure to explain why. Set clear expectations and limits for app and device usage. This goes for us, too! Explore and use apps that can, ironically, help to limit tech. There are a number of filters, of course. But also try apps like Freedom or Moment (for iPhone), AppDetox or StayOnTask (for Android), and OffTime or BreakFree (iOS and Android). How have you and your family reduced your “addiction” to your smartphones and devices? Help us out with your ideas by adding to the comments below! Previous Post Challenge: Put yourself on a Facebook diet Next Post Dangerous apps kids should not have on their phones. Period.